Omega-3 supplements: No great benefits, no harm. Don’t bother with omega-3 supplements for your toddler. Feed her fish instead. Most infant formulas are now fortified with extra DHA anyway. If you’ve turned on the TV lately, you’ve probably seen the commercial for Enfagrow Toddler Next Step, a new powdered drink made by formula manufacturer Enfamil. The advertisement starts with a close-up of a puzzle missing a single piece, cuts to an adorable toddler doing said puzzle, and hits you with this nail-biter: “Is something missing from your toddler’s nutrition?” The voiceover lady goes on to explain that your child is probably not getting enough of the omega-3 fatty acid DHA (docosahexaenoic acid), “an important nutrient that can help nourish the brain.” In fact, she says, “toddlers only get about 25 percent of the amount of DHA many experts recommend.” Luckily, Enfagrow can fill that gap! Do toddlers need those supplements? Parenting magazine explains that DHA “jump starts the production of a hormone that’s crucial for brain development” for infants and toddlers. BabyCenter recommends omega-3 supplements for kids who don’t eat fatty fish at least once a week (and no, store-bought fish sticks don’t count). On the other hand, the Cornucopia Institute, a nonprofit organization that supports sustainable and organic agriculture, published a report in 2010 in which it warned that the omega-3 fatty acids added to infant and children’s drinks are “dangerous and unnecessary” and can cause diarrhea, rashes, and even seizures. So what’s the deal—are omega-3 supplements critical or harmful? It seems that the answer to this question is a reassuring neither. Although omega-3 fatty acids such as DHA are important building blocks for the developing brain, and average consumption by American kids these days is quite low, there is little evidence to suggest that children become smarter or healthier when they take omega-3 supplements. In fact, there’s no clear consensus on how many omega-3 fats kids actually need. Most scientists and doctors agree, too, that it’s smarter to get nutrients through whole foods when possible—so if you want to engineer a nutritionally perfect toddler, feed her omega-3–rich salmon (among other things), not supplements. If, however, she prefers to throw her seafood than to eat it—in other words, if she isn’t getting any omega-3s from her diet and you can’t do anything about it—supplements can’t hurt. After taking a close look at the evidence, I’m confident that the safety concerns raised about the omega-3s added to formulas and kids’ drinks are not based in solid science. First, some background on why there’s so much hype about these fats. Our bodies can’t make omega-3 fatty acids from scratch. We can make some DHA and EPA (eicosapentaenoic acid, another important omega-3 fat) from the precursor ALA (alpha-linolenic acid, an omega-3 fat found in walnuts and flaxseeds), but we do so very inefficiently. As a result, it’s best to get DHA and EPA directly from fatty fish, their most concentrated source. These fats are what you might call good fats—they don’t make us fat, but rather, they help our bodies, and particularly our brains, function properly. About 15 percent of the fat found in the brain is DHA, where the molecule helps brain cells function and react quickly. Omega-3s are also used to build parts of the eye, to maintain proper cell structure throughout the body, and to make hormones known as eicosanoids, which are important for a range of physiological functions both in the brain and elsewhere. Animals who are fed omega-3–deficient diets end up with learning and visual problems; some studies have also found associations between abnormal fatty acid levels in children and behavioral or developmental problems such as ADHD, autism, and reading and memory difficulties. But before you run out to stock up on Enfagrow, there are some important caveats to consider. Just because fatty acid deficiencies have been linked to developmental problems doesn’t mean that the deficiencies cause the problems. In fact, researchers studying these links theorize that kids with developmental disorders or cognitive problems may have trouble metabolizing fatty acids—in other words, the disorders may cause omega-3 deficiencies, not vice versa. Supporting this notion, several studies and systematic reviews have shown that giving kids with these disorders omega-3 supplements does not improve their symptoms. Also, some studies have found higher than normal levels of certain fatty acids in kids with developmental problems. Overall, there’s no good evidence to suggest that children who take omega-3 supplements fare better than those who don’t. I said “good evidence” because there are indeed some studies suggesting that kids who consume more omega-3s have better cognitive skills, but these are mostly observational or cross-sectional studies, which can be fraught with problems. Some analyze fatty acid levels in kids at a single point in time and compare these measurements to parent- or teacher-reported behaviors to see if low fatty acid levels correlate with poor behavior, but a single blood measurement may not accurately reflect a child’s usual omega-3 intake; plus, parental behavior reports are often biased. Other studies compare kids who happen to consume more omega-3s with kids who happen to consume less, but these kids often differ in many ways. They eat different diets overall, have different parents, live in different neighborhoods. If my son has higher blood DHA levels than similarly aged little boys who are growing up below the poverty line, it’s not the fatty acids that explain why he is more likely to go to college. Indeed, when you look at well-controlled studies, which try to minimize biases and confounding factors, you see few benefits associated with omega-3 supplements for kids. (Researchers try to tease out true causal relationships through randomized controlled clinical trials, which, in this case, randomly assign some kids to consume omega-3 supplements and randomly assign others not to. Then the researchers, ideally unaware of which group is which, observe and compare both groups over time to see how they fare.) In 2011, the Cochrane Collaboration, a nonprofit independent research organization, analyzed the results of 15 randomized clinical trials that had evaluated whether omega-3–fortified infant formulas, fed to full-term babies for up to the first year of life, provide developmental benefits compared with nonfortified infant formulas. The researchers concluded that the omega-3 formulas “had no proven benefit regarding vision, cognition or physical growth.” A 2008 Cochrane review came to similar conclusions about supplementing premature babies. Likewise, a 2011 review of published clinical trials undertaken by the European and North American societies for pediatric gastroenterology, hepatology, and nutrition were “unable to find evidence” that giving kids older than 2 omega-3 supplements improved their cognitive abilities. They also found that “most health claims about supplementation of omega-3 long-chain polyunsaturated fatty acids in various diseases in children and adolescents are not supported by convincing scientific data.” Clinical trials find little evidence, too, that omega-3 supplements given to pregnant or breastfeeding women improve infant development. These findings don’t mean that omega-3 supplements are simply useless. It could be that supplementing with certain fatty acids at certain ages and in certain doses is beneficial, at least for certain kids—but that few, if any, trials have nailed down the perfect formulas or situations in which that’s true. Clinical trials are typically short, too, so they might miss health benefits that accrue over time or manifest themselves later in life. What about potential harms? The Cornucopia Institute warns that the fatty acids added to infant formulas and drinks like Enfagrow, which are purified from algae and fungi using strong solvents such as hexane, are structurally different from the omega-3s naturally found in breast milk and that these differences could pose gastrointestinal risks. In fact, the group, along with the National Alliance for Breastfeeding Advocacy, went as far as to petition the Food and Drug Administration in 2008 to require warning labels on omega-3–fortified infant formulas. To back up their stance, the organizations cited several sources. One was an FDA letter sent in May 2001 to Martek Biosciences, the company that sells these purified omega-3s to formula manufacturers. In it, the agency noted that although these compounds are similar enough to natural forms of DHA and EPA to be “generally recognized as safe,” the FDA had concerns because “some studies have reported unexpected deaths among infants” fed these formulas. The FDA also mentioned other possible side effects, including diarrhea, flatulence, jaundice, and apnea. Sounds scary, right? Well, it turns out that the FDA may have been overstating the evidence just a tad. The “unexpected deaths” were based on data from an industry-funded, academic-researcher-run clinical trial described in two papers published in 1999 and 2000. 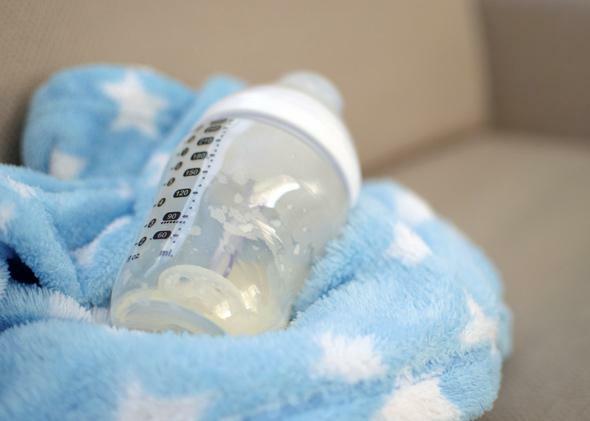 The trial was designed to test the safety and efficacy of omega-3–fortified formulas compared with unfortified formulas or breast milk in 288 premature infants. There was indeed one SIDS death in the omega-3–fortified formula group, but as the trial explained, the attending physician believed that the death was unrelated to the formula the baby was drinking. One other baby died, too, but this infant was getting breast milk. Overall, the trial found only a few statistically significant differences between the two formula groups in terms of side effects: The babies given the omega-3–fortified formula were more likely to have gas, but they were less likely to develop anemia or cow’s milk allergies. These findings hardly suggest that omega-3­–fortified formulas are dangerous. Furthermore, the FDA tracks the adverse event reports it gets about infant formulas via its MedWatch program; keeping in mind that there were no omega-3–fortified formulas on the market before 2002 and that almost all commercial formulas were fortified with omega-3s by 2008, the agency has found “no statistically significant increases in the proportion of gastrointestinal adverse events reports in the Center for Food Safety and Applied Nutrition’s Adverse Event Reporting System when we looked over the time interval from when infant formulas containing DHA and ARA oils were first introduced until they essentially replaced non­-supplemented formula in the market place,” as it explained in a 2011 letter sent to the Cornucopia Institute. So—the bottom line? Don’t feel pressured give your kids omega-3 supplements if they’re healthy and eating well. Companies do all they can to convince us that our wee ones need their products, but the evidence just doesn’t back up this claim. Do, however, try to ensure that kids eat one or two weekly servings of fatty fish low in mercury, such as salmon. If you’re pregnant or breastfeeding, try to meet the recommendations of the World Association of Perinatal Medicine by consuming at least 200 milligrams a day of DHA—ideally, again, through fatty, low-mercury fish. (One 3.5-ounce serving of wild Alaskan salmon provides 1,450 mg of DHA, about a week’s worth for a pregnant or breastfeeding woman.) And if you’re feeding your baby formula, you definitely don’t need to supplement since most formulas already contain extra DHA. What if you have an 18-month-old who simply refuses to eat fatty fish, no matter how you prepare it? (Or what if, like me, you’re pregnant and the thought of salmon or sardines makes you wretch?) In this case, supplements might be smart, and this post provides guidelines for the amounts of omega-3s children of different ages may need. But don’t give up: Keep putting fish in front of your kids and ask them to try a bite each time, because repeated tastings can overcome food fears and aversions. (For more on this, see my picky eating column; also, get creative with how you prepare the fish.) You can turn to DHA-fortified eggs and milks, too, but some brands only supply small amounts, and they can be expensive. Ultimately, whenever you can, maximize your kids’ health through food, not pills or powders. Doing so may have the added bonus of teaching them an important life lesson: Good nutrition starts in the kitchen, not in the medicine cabinet.